Enter a word in English or Portuguese and get the translation. 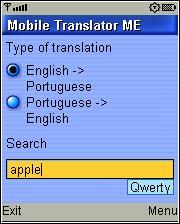 The app “MTEnglishPortuguese” (49 KB) is ready to download or send to your phone as filename:”EngPorTran”. Needed it for my job. Work with many Brazillian people and this is handy, though the dictionary is a bit limited.